oh, it’s good to be back in this space this afternoon. It’s like coming home from your first overnight at a friend’s house…you had a good time, but you’re tired and ready to get back to what’s comfortable. I’m still finding my voice over there on the babycenter website. My dad said to me at lunch yesterday–"after reading your posts over there, I just wanted to tell you to relax, molly. be yourself." I’m trying. It’s a bit like starting over again, with those fumbling first posts I wrote more than two years ago. In the meantime, I’m finding brain turn-off time when I’m in front of my knitting. I’m working on a quick, easy pair of booties for Elizabeth, who can’t keep a pair of socks on to save her life. It doesn’t help that she has a three year old big sister who enjoys pulling them off her feet as well–especially in stores, then dropping on the ground, whichever aisle we might be in, and silently walking away. The pattern is from Last-Minute Knitted Gifts. Seems like every book in this collection of ‘last-minute gifts’ is really good. PS. Thanks for all the comment love over there on the new blog. It really helps a girl’s heart. I loved my girls’ Robeez shoes which kept socks on for both my infants from newborn stage to 3 years. We love them! I wish they were made for larger children too! Plus, they are machine-washable! I have kept their newborn Robeez for K and N when they are adults! I just couldn’t rid of them! They should be available in the US soon; you may be able to purchase them on ebay. sounds eerily like my evening! If you substituted the word Boys for Girls and Little Bear for Charlotte’s Web you’d have most of my nights! Sounds divine. Enjoying your babycenter blog posts…We all need a little time to get comfy in a new place. That is my favorite knitting book. 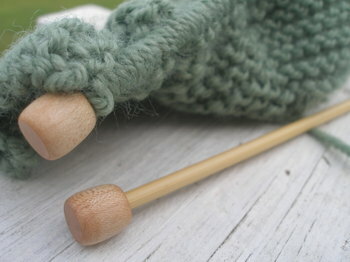 I just got the 8 inch clover circulars for the fingerless gloves. Those are some tiny needles but I am so excited to get them started. Eleanor’s socks are also regularly pulled off by her very-nearly-2-year-old big brother! Thanks for sharing those first posts, it gives a girl like me encouragement!! You know what it is….it’s hard to find your voice when your not sure who is actually reading your thoughts. In your case, I think it is clear that your friends are checking in over at momformation and everybody is rooting for you! !Thanks again for such nice comments yesterday!! Next Next post: thank you erin.